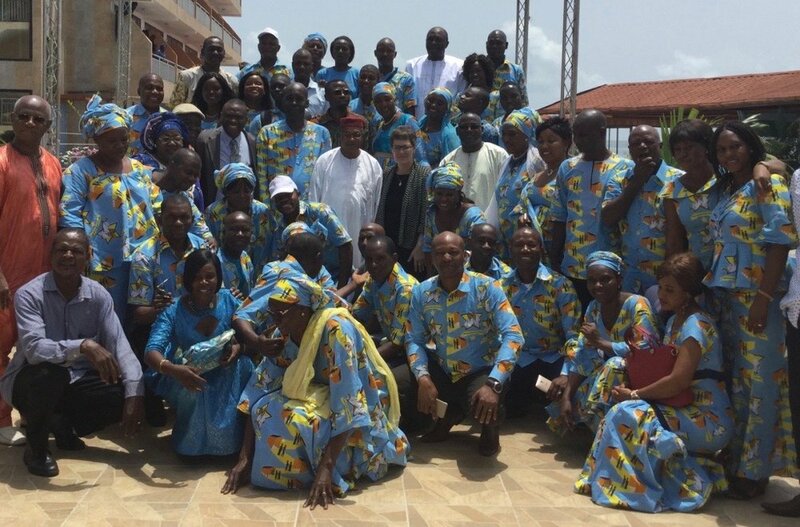 In early 2017, Eliza developed the “Gold Star Clinics” cloth pattern in close collaboration with the HC3 team in Guinea to generate a more widespread recognition of the Gold Star branded health centers. The team’s goal was to significantly impact maternal, neonatal, and child health outcomes by encouraging women to attend pre- and postnatal care visits and give birth at a Gold Star clinic. The pattern tells the story of a pregnant couple that leaves home to visit their community clinic for prenatal care and delivery. Pathways between homes and clinics symbolize the countrywide network of Gold Star clinics. With GAIA Vaccine Foundation, Eliza received grant funding for the design from GlobalGiving.org and 3,000 yards were printed in Ivory Coast.